Things had become relatively quiet on the Star Wars front. The last movie, Return of the Jedi, was released in 1983. The last television series, Ewoks, ended its run in 1986. George Lucas, who had created a substantial backstory for his universe during production, was initially planning to work on another trilogy of films, but the taxing process of creating the first three coupled with a bitter divorce caused Lucas to unofficially cancel those plans. So, for the next decade, fans had to make do with video games, comic books and novels based on the franchise for new content. 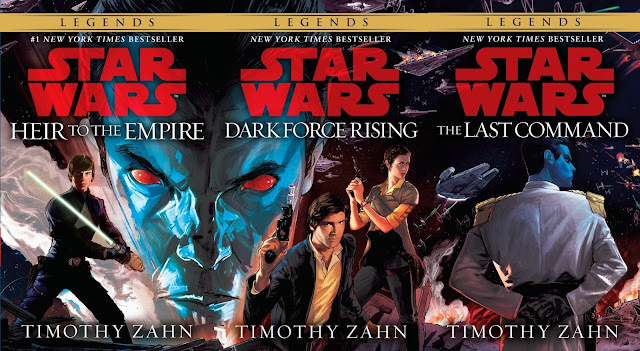 1993 novels that helped Lucas realize Star Wars still had fans. By 1993, when Lucas realized there was still a significant fanbase and that special effects technology had finally evolved enough to adequately capture his vision, his interest in the franchise was reinvigorated. Fascinated with the idea of prequels, Lucas began taking the excised ideas from the original trilogy and crafting them into the next trilogy. The posters of the prequel trilogy. 1999 saw the release of The Phantom Menace, also known as Star Wars: Episode I which caused the original trilogy to retroactively be renamed Episodes IV-VI. Attack of the Clones followed in 2002 and the trilogy came to a conclusion in 2005’s Revenge of the Sith. The prequels filled in the blanks of the original trilogy’s story, with Anakin Skywalker’s (Jake Lloyd and Hayden Christensen) fall from Jedi to the Sith Lord Darth Vader, the rise of the Confederacy of Independent Systems, also known as the Separatists, into the Galactic Empire, and the ultimate destruction of the Jedi Order. In 2003, Lucasfilm and Cartoon Network Studios put into production an animated series created by Genndy Tartakovsky. 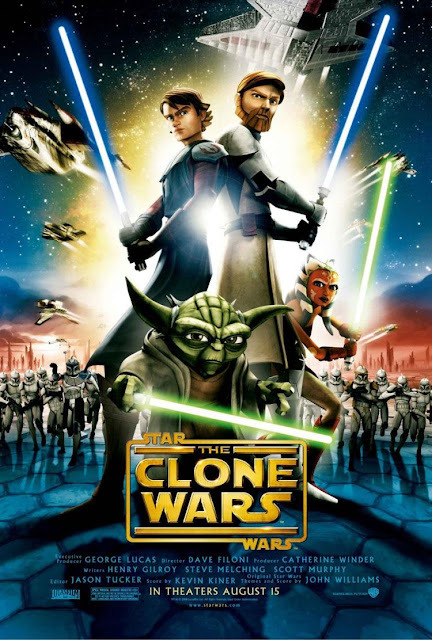 Star Wars: Clone Wars was set between Attack of the Clones and Revenge of the Sith and was designed to expand upon the mentioned Clone Wars that took place in that time period. The series depicted the Galactic Republic and Jedi Order under siege from the Separatists as they sought to leave the Republic with Sith help. The show ran for three seasons and 25 episodes; the first two comprised of 3-minute episodes while the last ran for 12-15 minutes. Concept art for Bad Batch Troopers. The series was a big hit for Cartoon Network. Inspired by that success, executive producer Lucas declared it to be a “pilot series” and that a new Clone Wars CGI series would be underway picking up where the last left off. Tartakovsky wasn’t involved in the new series, with Dave Filoni instead heading it up. 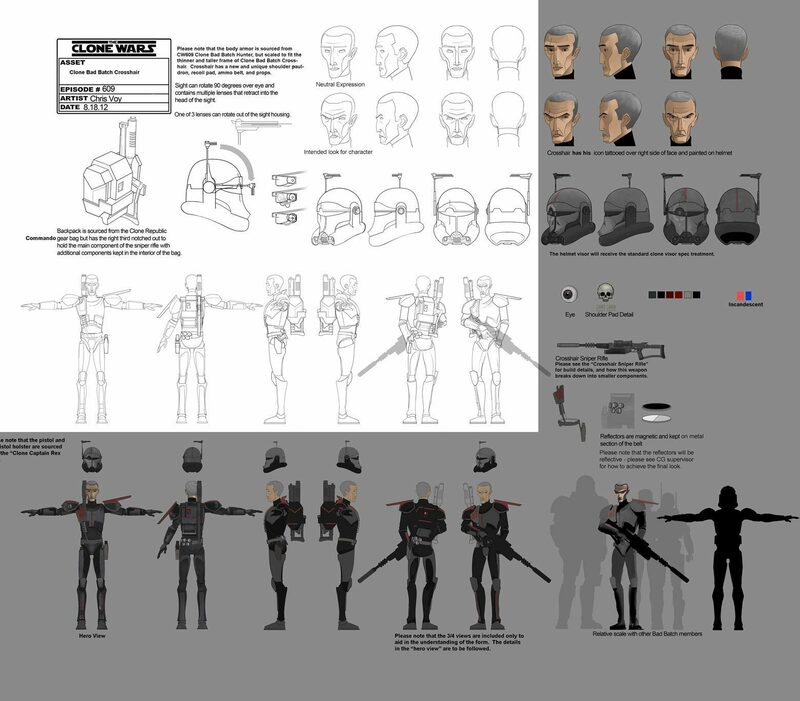 However, Clone Wars was heavily referenced by character designer Killian Plunkett and the animators for designs and movements. Lucas was heavily involved in the production of the series. Filoni’s original idea for the series revolved around a group of characters that traveled n a space ship similar to the Millennium Falcon. The crew would be comprised of a smuggler, his girlfriend, a gungan named “Lunker”, a Jedi Master and his Padawan. The intention was to avoid conflicting with established continuity, meaning established characters would only make occasional appearances. Lucas, however, decided to make the show’s focus on film characters while incorporating some of Filoni’s ideas. Anakin Skywalker and Obi-Wan Kenobi amongst Clone Troopers. Anakin Skywalker (Matt Lanter) and Obi-Wan Kenobi (James Arnold Taylor, reprising the role from the previous show) returned as central characters to the series. However, the show, now called THE Clone Wars, was made episodic in nature which meant it often focused on side characters or revisited prior events from different angles. Other previously established film characters included Jedi High Council Master Mace Windu (Terrence C. Carson); former queen and galactic senator (and Anakin’s love-interest) Padmé Amidala (Catherine Taber); droids R2-D2 and C-3PO (Anthony Daniels, reprising the role from the films); evil Sith Lord Emperor Palpatine/Darth Sidious (Ian Abercrombie until his death, followed by Tim Curry); slug-like crime boss Jabba the Hutt (Kevin Michael Richardson); bounty hunter Boba Fett (Daniel Logan reprising the role); fallen Jedi Master Count Dooku (Corey Burton); former senator and co-founder of the Rebel Alliance Mon Mothma (Kath Soucie); the dual-bladed lightsaber wielding Darth Maul (Samuel Witwer); the much-maligned comic relief character Jar Jar Binks (B.J. Hughs in early episodes, then Ahmed Best reprising the role); and Grand Master of the Jedi Order Yoda (Tom Kane), amongst others. Characters from the prior show also made appearances, notably Dooku’s once-apprentice Asajj Ventress (Nika Futterman) and lightsaber-wielding droid General Grievous (Matthew Wood), who also made his debut on film in Episode II. Initially, Lucas put restrictions on the production team on which characters and environments could be utilized in the show, but those restrictions gradually reduced over time. Newly created for the series was Anakin’s Padawan Ahsoka Tano (Ashley Eckstein), based on Filoni’s original concept named “Ashla.” Ahsoka was created to show how Anakin went from the brash and reckless Padawan in Episode II to the more reserved Jedi Knight in Episode III. Filoni initially had trouble writing the 14-year-old female character, deciding instead to focus on her being a Jedi who happens to be a young girl. Audiences initially found the character annoying as she was depicted as somewhat of a brat; much of the same criticisms Anakin’s character received in regards to the prequel series. As the show was over a year ahead in production by the time episodes were aired, Eckstein, well aware of the character’s evolution and growth, pleaded with fans to be patient. That patience was amply rewarded as Ahsoka grew into what is considered to be one of the strongest female characters in the entire franchise. Captain Rex, commander of the 501st Legion. Another popular new character was Captain Rex (Dee Bradley Baker), leader of the 501st Legion of Clone Troopers. Initially, the character was going to be Alpha-17, featured in Star Wars: Republic, but Lucas felt having another lead character with an “A” name created too much alliteration. Lucas chose the name “Rex” for him, which was the name of the error-prone rookie droid pilot RX-24 (Paul Reubens) of Star Tours, who in turn was a replacement for an unpredictable and risk-taking Clone Wars veteran. Rex was fleshed out to be what the other clones inspired to be. Baker also voiced all the Clone Troopers and focused on one or two individual traits for each of them to keeps his performances distinct and separate. The Clone Wars also introduced a new bounty hunter character: Cad Bane (Burton). Bane was no-nonsense and ruthless, taking no prisoners and doing whatever it took to claim his bounty. Initially, Filoni and head/series bible writer Henry Gilroy planned to adapt the character of Durge from the previous series, but Lucas suggested to them to go Western. They took inspiration from the character of Angel Eyes (Lee Van Cleef) in The Good, the Bad and The Ugly, Colonel Mortimer (also Cleef) in For a Few Dollars More, and an unused character concept from the original trilogy to create Bane. Burton used Peter Lorre’s voice as inspiration, which was then modified by the computer of the sound production team. Lucas initially had trouble getting a network interested in The Clone Wars. FOX passed on it and Cartoon Network was reluctant. Eventually, a bidding war erupted between networks for the rights to the show. Stuart Snyder, who became the President of Cartoon Network in 2007, was interested in the series upon taking the job and immediately acquired it after screening several episodes. While previewing completed footage on a big screen, Lucas decided that the series was strong enough to be turned into a film. The first five episodes were subsequently woven together to create a single story for theatrical release. Star Wars: The Clone Wars introduced Anakin to his new Padawan as they were tasked with rescuing Jabba the Hutt’s abducted son, Rotta (David Acord), while Obi-Wan negotiated with Jabba for a treaty between the Hutts and Republic. Christopher Lee and Samuel L. Jackson reprised their respective roles of Count Dooku and Mace Windu for the film, as did Matthew Wood as the battle droids (whom he would continue to voice in the series). The Clone Wars film opened on August 15, 2008 and was met with poor reviews upon its release; many of them targeting the animation style used in the production. Lucasfilm and Lucasfilm Animation used Autodesk software and the Maya 3D modeling program to animate the series. The animation style was meant to pay homage to Japanese anime and manga, as well as the supermarionation of the 1960s show Thunderbirds. Lucas wanted the characters to be stylized over realistic, and to avoid emulating Pixar’s style in order to have their own uniqueness. Those decisions ultimately drove home the negative reception to the film; whose purpose to introduce an animated series was also called out on. However, despite the criticisms, the film ended up becoming a financial success by pulling in $68.3 million against its $8.5 million budget. Warner Bros., who distributed the film, was satisfied with its performance knowing it would be a hard sell as not only an animated feature, but a tie-in for an animated series. 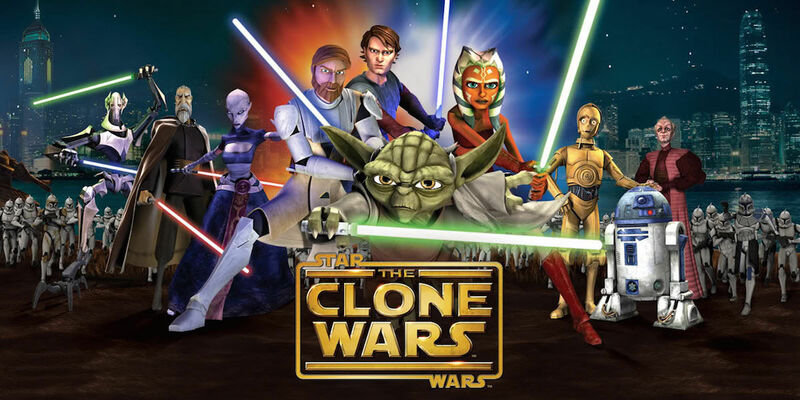 Star Wars: The Clone Wars began on Cartoon Network on October 3, 2008. The hour-long premier episode set a new record as the network’s most-watched premier with 3.992 million viewers. Each episode began in similar fashion to the movies, with the title quickly entering the screen and moving further into the background against John Williams’ theme. A quote would follow in a font similar to the “A long time ago in a galaxy far, far away…” text leading into a recap narration. The series ended up running for the five seasons, 100+ episodes initially promised by Lucas when it was first announced. Between the first and second seasons, Cartoon Network reran seventeen episodes as The Clone Wars: Decoded. Pop-up boxes that would feature trivia and behind-the-scenes information related to the episode were added. Anakin gets a vision of his future. While episodes were presented as an anthology of standalone episodes and small story arcs, each season had a largely different overreaching theme for its duration. The first season amounted to the Republic and Separatists trying to convince various planets to side with them, with Grievous and Dooku serving as the primary antagonists. The second season, promoted as Rise of the Bounty Hunters, saw the Sith utilizing bounty hunters to accomplish their goals while the Republic made strategic strikes against the Separatist forces. Seasons 3 and 4 take a more political turn, showing how the war affected different planets and races. The first half of season 3, marketed as Secrets Revealed attempted to make the show more cohesive as it was set between events of the previous seasons to create a better chronology. Character designs also began to change to showcase the passage of time during the series. Season 4 was marketed as Battle Lines. Both seasons also saw Anakin’s gradual slide towards the dark side. Season 5 gave more of a focus to Ahsoka’s character development and the Separatists gaining more ground. Season 5 also saw the show move from its regular Friday night timeslot to Saturday mornings. Along with Filoni and Gilroy, writers for the series included Drew Z. Greenberg, Scott Murphy, Christian Taylor (head writer for seasons 4 and 5), Steven Melching, Katie Lucas (George’s adopted daughter), Chris Collins, Matt Michnovetz (head writer for seasons 6 and 7), Brent V. Friedman, Paul Dini (who also wrote for Ewoks), Eoghan Mahony, Daniel Arkin, Charles Murray, George Krstic, Steven Long Mitchell, Craig W. Van Sickle, Cameron Litvack, Bonnie Mark, Jose Molina, Melinda Hsu Taylor, Brian Larsen, Craig Titley, Julie Siege, Jonathan Rinzler, Tim Burns, Kevin Campbell, Kevin Rubio, Bill Canterbury, Jen Klein, Andrew Kreisberg, Wendy Mericle and Ben Edlund. While some of John Williams’ theatrical music was utilized, Kevin Kiner provided the majority of the show’s music. 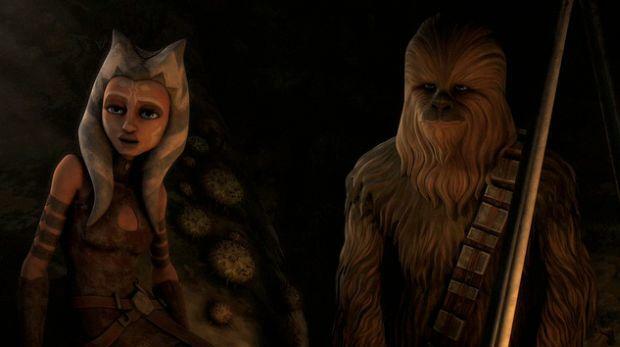 Ahsoka teams-up with the legendary Chewbacca. A number of actors from the films participated in the series in some form or other; either reprising their characters or playing new ones. Aside from the ones already mentioned, Peter Mayhew returned as the Wookie warrior Chewbacca; Liam Neeson returned as Qui-Gon Jinn; Pernilla August as Anakin’s mother, Shmi Skywalker; and Greg Proops playing the new role of Tal Merrik. Luke Skywalker himself, Mark Hamil, also a noted voice actor, guest-starred in an episode as Darth Bane; the sole-surviving Sith from the Jedi-Sith War. Notable guest-stars included Star Trek veteran George Takei as weapons designer and Separatist general Lok Durd; actor and director Jon Favreau as Pre Vizsla, leader of the Death Watch; actor and director Simon Pegg as bounty hunter Dengar; Battlestar Galactica veteran Katee Sackhoff was Bo-Katan, lieutenant of the Death Watch; and actor and comedian Seth Green as techno-service droid Todo 360. The beginning of the end for The Clone Wars. While the show’s ratings numbers had dropped a bit over the years, it was still showing a respectable viewership; even after moving from its Friday timeslot to Saturday mornings. But, while the show was in production, Disney had acquired Lucasfilm and its assets. Wanting to do their own show that would air on one of their networks, they ultimately decided to cancel The Clone Wars. At the time of the cancellation, work on the next three seasons was already underway in various stages of production: 13 full episodes had been completed, storyboards and voice recording for eight episodes were done, and scripts beyond that were already written. A scene from one of the season 6 Story Reels. Ultimately, that work wasn’t left to rot. The 13 fully completed episodes were released as “Season 6: The Lost Missions” in 2014. The season explored the details behind Order 66 that led the Clone Troopers to turn on the Jedi and wipe out their order. The episodes aired first in Germany on Super RTL and then widely on Netflix. Two more story arcs were rendered as animatics, called story reels, and included on the season 6 Blu-ray release. A 4-episodes arc continuing the story of Darth Maul’s resurrection in “Brothers” was adapted into a comic book mini-series published by Dark Horse Comics. Called Darth Maul: Son of Dathomir, it was adapted by Jeremy Barlow with art by Juan Frigeri. 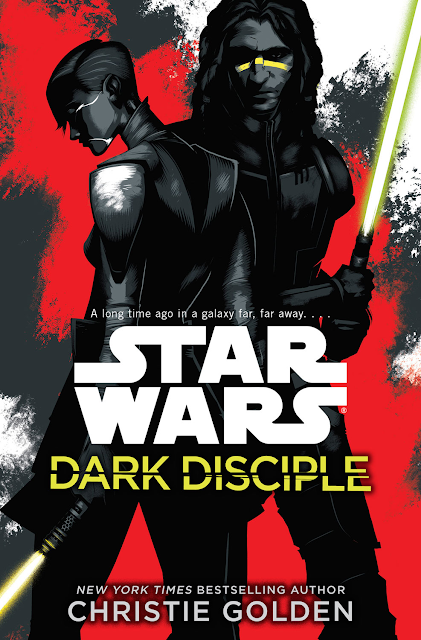 An 8-episode arc featuring Asajj Ventress and Quinlan Vos was adapted into the novel Dark Disciple, named after one of the episodes, written by Christie Golden and published by Del Rey in 2015. Katie Lucas, who wrote one of the adapted episodes, provided a forward for the book while voice actor Marc Thompson narrated the audio version. As with any prequel series in a long-running science fiction franchise, The Clone Wars often offered contradictory information and accounts to the official canon; either in its own narrative or through supplemental materials. However, following Disney’s acquisition and the announcement of a new film series, Lucasfilm announced a reorganization of what was known as the “Expanded Universe” on April 25, 2014. 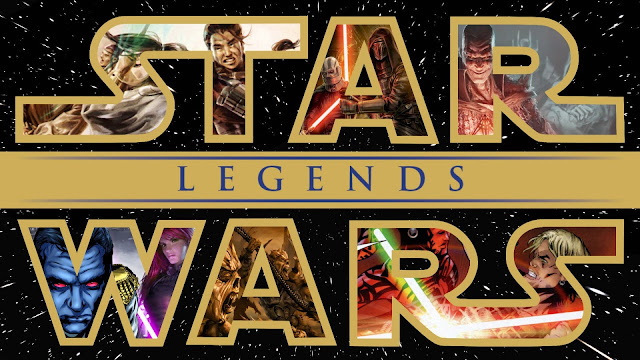 Rebranded as “Star Wars Legends”, that meant anything not presented on screen in the films or either of the shows before the announcement was no longer an official part of Star Wars continuity. The move was designed to iron out some of the wrinkles in the franchise’s narrative and allow it to move forward with a relatively clean slate. Like other Star Wars media, The Clone Wars was heavily merchandised. Hasbro produced a line of action figures based on the movie and show, and LEGO buildable sets. Toys based on the movie and the show were included in McDonald’s Happy Meals. Topps released three sets specific to The Clone Wars: one for the movie, a sticker set, and a “Widevision” set. Characters from the show continued to appear on cards in additional sets following. A 1GB MP3 player came with three interchangeable faceplates featuring Yoda, Captain Rex and the Galactic Empire logo. To promote the film and series, Marco Andretti drove The Clone Wars/Blockbuster Inc. car at Infineon (now Sonoma) Raceway. Along with Dark Disciple, there was a novelization of the film by Karen Traviss, the follow-ups Wild Space and No Prisoners by Karen Miller and Traviss, and the two-book Clone Wars Gambit by Miller. Another novel series, called Secret Missions, was published by Grosset & Dunlap between 2009 and 2012. The four books were written by Ryder Windham and featured new characters and events. Aside from novels, a series of reference books were also released. DK Publishing published The Visual Guide, The Visual Guide: Ultimate Battles, Character Encyclopedia, New Battlefronts: The Visual Guide, Incredible Vehicles, and a complete episode guide. Chronicle books published The Art of Star Wars: The Clone Wars. Sunbird released their own episode guide for the first two seasons. Wizards of the Coast made a Campaign Guide as a supplement to their Star Wars Roleplaying Game Saga Edition. A page from the season 2 webcomic. 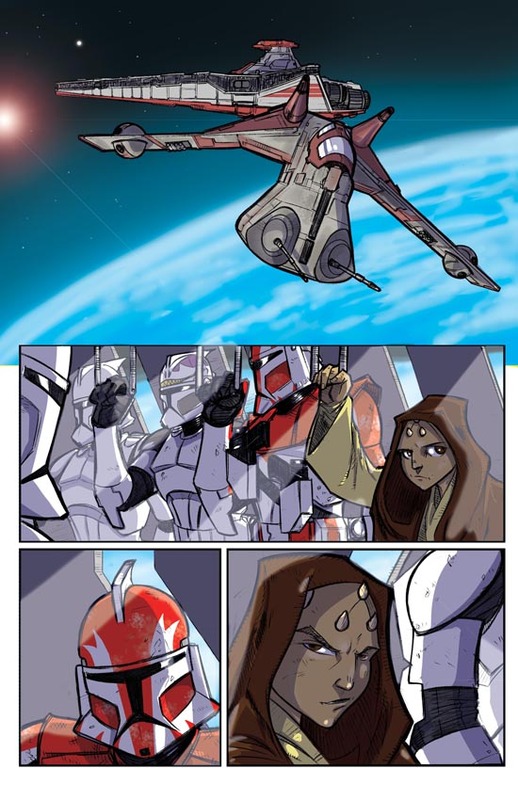 StarWars.com published a webcomic between 2008 and 2011 that often served as a direct prequel to the related episode of the series. It ran weekly until season 4 when it was discontinued. The comics were written by Pablo Hidalgo and Gilory, with art by Jeffery Carlisle, Katie Cook, Grant Gould, Thomas Hodges, and Daniel Falconer. 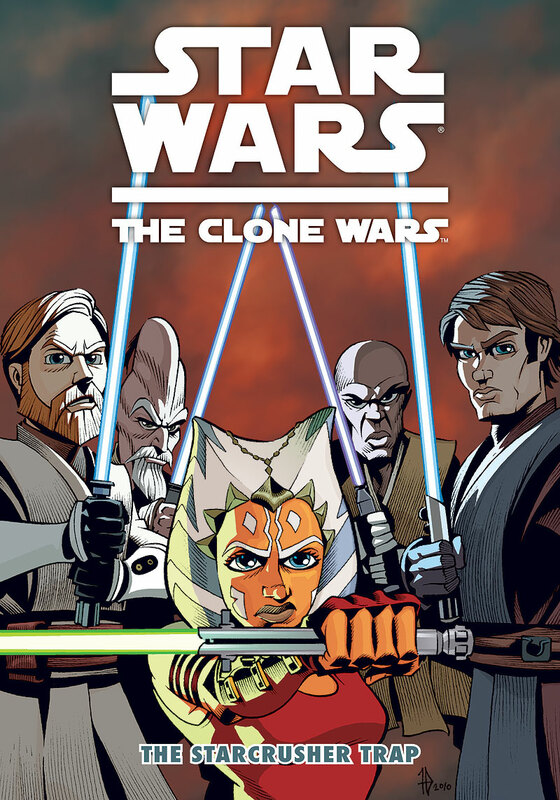 The season 1 comics were collected in the trade Tales from the Clone Wars published by Dreams & Visions Press. StarWars.com also ran an official podcast called HoloNet News, which featured in-universe broadcasts detailing events of the show. The podcasts were written by Hidalgo and narrated by Kevin Yost. Cover to one of the graphic novellas. Dark Horse, which held the Star Wars license, produced a 6-issue limited series written by Gilroy. Because of the suddenness of the film, Dark Horse had to delay their intended series Dark Times and Rebellion in order to get the books out in a reasonable time. The opening arc was later adapted into three episodes in season four. After the book’s success, Dark Horse editor Randy Stradley announced that six more issues had been ordered, which were co-written by Melching. The series was ended after the 12th issue, citing the dwindling young comics readers market. Scott Hepburn, Ramón K. Perez, Lucas Marangon and Brian Koschak provided art for the series. Dark Horse also published a quarterly series of 11 digest-sized graphic novellas between 2008-13 written by Gilroy and John Ostrander with art by the Fillbach Brothers. Dark Horse released a short story starring Kit Fisto by Gilroy and Perez as part of their 2009 Free Comic Book Day offering, and an excerpt from the novella Strange Allies in 2011. Several video games based on the show were produced; many of them released in 2008. THQ Wireless released a mobile action/strategy game. Lucasfilm Animation Singapore developed Jedi Alliance for the Nintendo DS. The game featured an original story and had a team-building feature where you could pair up various combinations of Jedi Masters and Padawans and they would gain additional buffs as their relationships developed. Krome Studios developed Lightsaber Duels for the Nintendo Wii. The game allowed players to participate in duels seen in The Clone Wars film and the episodes “Duel of the Droids”, “Cloak of Darkness”, “Shaodw of Malevolence”, and “Destroy Malevolence”. Because the first season was still in production, the episodes “Lair of Grievous” and “The Hidden Enemy” weren’t included to avoid spoilers, however Kit Fisto and Grievous were playable characters. In 2009, Krome released Republic Heroes which was set between seasons 1 and 2. It was released across every platform available at the time, however the DS version had a different story based on episodes from the first two seasons as well as a databank of information about the show. In 2010, Sony Online Entertainment launched the massively multiplayer online game called Clone Wars Adventures. The game was free to play, with premium content made available with paid “Jedi” membership subscriptions. The game was shut down in 2014, with all players being given the parting gift of being made Jedi Masters and the price of in-game items being significantly reduced before the end. In 2011, Travellers’ Tales released Lego Star Wars III: The Clone Wars. Like the previous LEGO-based games, it featured humorous retellings of events from the first two seasons of the show and all of the characters, as well as some additional ones from the film franchise. The Clone Wars complete Blu-Ray (UK version). The Clone Wars Film was released in 2008 by Warner Home Video in a single-disc and two-disc special edition format, while Sony Classical released the soundtrack. 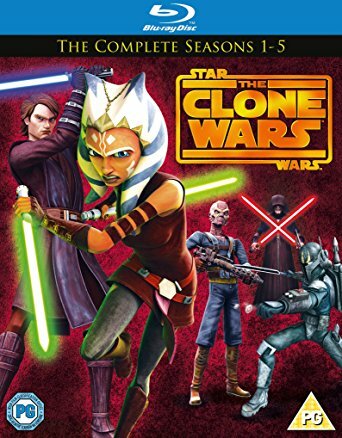 In 2009, Lucasfilm Animation released two compilation DVDs containing four episodes each from season one: A Galaxy Divided (which had five on the Wal-Mart edition) and Clone Commandos. Warner would release the complete first season on DVD and Blu-Ray by the end of the year. Season two followed in 2010 and season three in 2011. Another four-episode collection from season four, Darth Maul Returns, was released exclusively to Target stores in September of 2012; a month before the complete fourth season set. The collection was later made widely available that January. In October of 2013, the season five set and the complete collection were released and marked the final release from Warner. Buena Vista Home Entertainment would release The Lost Missions collection in 2014. Ahsoka confronts her former master in Rebels. Disney’s successor series was Star Wars: Rebels. Set before Episode IV and made with the involvement of many of the same people, some plots and characters from The Clone Wars were allowed to be featured and addressed, bringing them to a satisfying conclusion for the creators and fans. One such moment was the confrontation of Ahsoka and Darth Vader (James Earl Jones). The series was previewed with four shorts in August of 2014 before debuting on October 3, 2014. 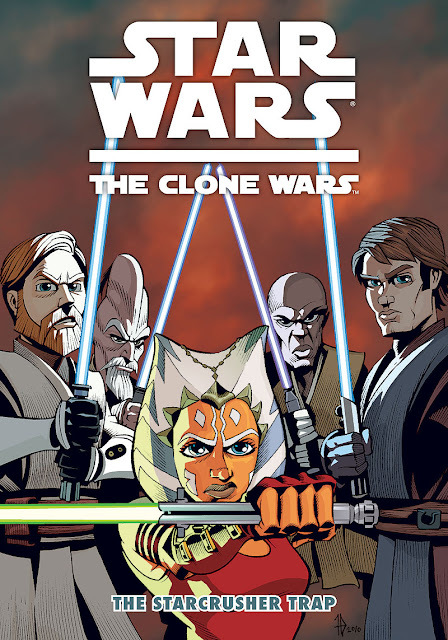 It ran for four seasons and, unlike The Clone Wars, was given a definitive and planned ending on March 5, 2018. The Clone Wars universe, as well as Rebels and the complete film franchise, was revisited in the micro-series Forces of Destiny. Its first season ran for 16 episodes between Disney’s YouTube channel and Disney Channel between July and November 2017. The series focused heavily on the female characters of the franchise, including Ahsoka and Padmé with Eckstein and Taber reprising their roles. When the complete series was released on Netflix, Lucasfilm released an official chronology for the narrative of the series. The numbers next to each episode title indicate where it’s meant to take place in the grand scheme of the series. 3-6. “The Movie” (8/15/08) – Anakin Skywalker is assigned a new Padawan just as he’s to embark on a mission to rescue Rotta the Hutt. 9. “Ambush” (10/3/08) – Yoda takes on Dooku’s assassin Asajj Ventress in order to secure a planet joining the Republic. 10. “Rising Malevolence” (10/3/08) – The Separatist starship Malevolence leaves Plo Koon and his troopers stranded until Anakin and Ahsoka can find them. 11. “Shadow of Malevolence” (10/10/08) – Anakin leads a squad of Y-wing bombers against Grievous and the Malevolence. 12. “Destroy Malevolence” (10/17/08) – Grievous takes Padmé and C-3PO hostage and Anakin and Ob-Wan must rescue them to complete the destruction of the Malevolence. 13. “Rookies” (10/24/08) – Rex and Cody have to inspire their rookie unit in order to get them to survive the coming droid commando invasion. 14. “Downfall of a Droid” (11/7/08) – Anakin must find a lost R2-D2 before the Separatists get at the military secrets in his memory banks. 15. “Duel of the Droids” (11/14/08) – Anakin, Ahsoka and R3-S6 engage on a rescue/sabotage mission when they learn R2-D2 is being held at Grievous’ secret enemy listening post. 16. “Bombad Jedi” (11/21/08) – Padmé is taken hostage on a planet that has pledged to the Separatists, and Jar Jar Binks disguises himself as a Jedi to rescue her with C-3PO. 17. “Cloak of Darkness” (12/5/08) – The Jedi have to keep Asajj Ventress from freeing the captive Nute Gunray on Coruscant. 18. “Lair of Grievous” (12/12/08) – Kit Fisto and Nahdar Vebb track Nute Gunray to a remote world and discover Dooku has tricked them into punishing Grievous for him. 19. “Dooku Captured” (1/2/09) – Anakin and Obi-Wan plan to kidnap Dooku, but discover a group of pirates have already done so. 20. “The Gungan General” (1/9/09) – Anakin and Obi-Wan are taken by the pirates, and their captain’s second in command attempts to intercept the ransom for himself. 21. “Jedi Crash” (1/16/09) – After crashing on the planet Maridun, Ayala and Ahsoka try to convince a native to help a wounded Anakin. 22. “Defenders of Peace” (1/23/09) – The Jedi leave the Lurmen village to save them from Separatist wrath, but the Separatists ultimately decide to use the village to test a new weapon. 23. “Tresspass” (1/30/09) – The Jedi attempt to negotiate peace with the inhabitants of Orto Plutonia, but Chairman Cho causes a war by wanting them under his control. 2. “The Hidden Enemy” (2/6/09) – After a battle goes south, it becomes clear that a traitor is hiding in the Republic. 24. “Blue Shadow Virus” (2/13/09) – Padmé and Jar Jar investigate a hidden bio-weapon lab on Naboo which leads to her capture by Dr. Nuvo Vindi. 25. “Mystery of a Thousand Moons” (2/20/09) – Anakin and Obi-Wan travel to planet Iego to find the cure for Vindi’s virus, but first they must help the residents there with their own problem. 26. “Storm Over Ryloth” (2/27/09) – Ahsoka ignores Anakin’s orders and loses most of her squadron in an attack against a Separatist blockade. 27. “Innocents of Ryloth” (3/6/09) – Obi-Wan plans to disable anti-aircraft guns located in a town, but discovers the residents are being used as shields. 28. “Liberty on Ryloth” (3/13/09) – His forces stretched thin, Mace Windu tries to convince a Twi’lek freedom fighter to join him against the Separatist droids. 55. “Hostage Crisis” (3/20/09) – Bounty hunters seize the Senate Building in order to demand the release of Ziro the Hutt. 29. 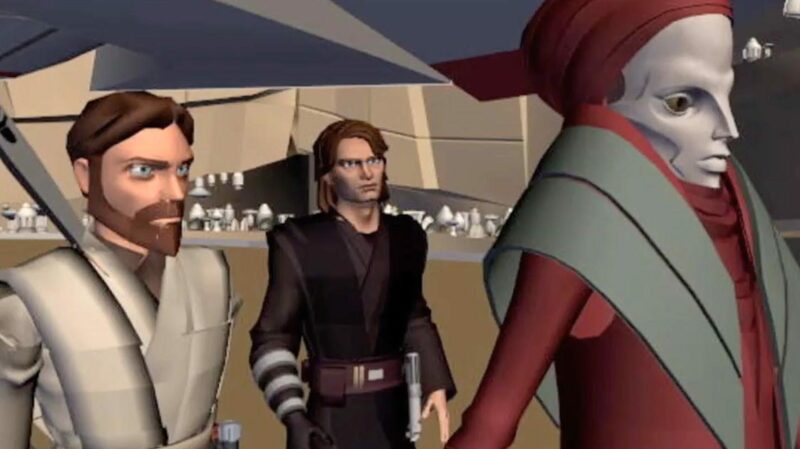 “Holocron Hesit” (10/2/09) – Obi-Wan and Anakin try to prevent Cad Bane from stealing a holocron from the Jedi temple while Ahsoka discovers a shapeshifter posing as a Jedi. 30. “Cargo of Doom” (10/2/09) – Anakin and Ahsoka try to retrieve the holocron from Cad Bane before he can sell it to the Separatists. 31. “Children of the Force” (10/9/09) – Cad Bane uses the holocron to kidnap Force-sensitive children. 35. “Senate Spy” (10/16/09) – The Jedi have Padmé spy on Senator Clovis to see if he’s working for the Separatists. 36. “Landing at Point Rain” (11/6/09) – On information taken from Clovis, the Jedi lead a clone trooper assault on a massive droid factory on Genosis. 37. “Weapons Factory” (11/13/09) – While the Jedi take on super tanks, their Padawans sneak into the droid factory to destroy it. 38. “Legacy of Terror” (11/20/09) – When Luminara is captured, Anakin, Obi-Wan and Cody enter a colony of Genosian zombies to find her. 39. “Brain Invaders” (12/4/09) – On the way to transport medical supplies, the clone troops are infected with mind-controlling worms and turn on Ahsoka and Barriss. 40. “Grievous Intrigue” (1/1/10) – Obi-Wan plays bait to lure Grievous into a trap and distract him long enough for Adi Gallia and Anakin to rescue Eeth Koth from his possession. 41. “The Deserter” (1/1/10) – Grievous escapes to Saleucami and searches for a ship to get off the planet, while Cody and Rex search for him. 42. “Lightsaber Lost” (1/22/10) – Seemingly feeble elder Jedi Tera Sinube helps Ahsoka recover he lightsaber from a pickpocket. 43. “The Mandalore Plot” (1/29/10) – Obi-Wan protects the Duchess Satineof Mandalore from the Death Watch terrorist group. 44. “Voyage of Temptation” (2/5/10) – On the way to Coruscant with Satine, assassin droids are found on their ship while Obi-Wan tries to find the traitor amongst them. 45. “Duchess of Mandalore” (2/12/10) – Satine disguises herself as a civilian to avoid her assassins and make her case to the Coruscant Senate. 59. “Senate Murders” (3/12/10) – Padmé and Bail Organa investigate the murder of Senator Onaconda Farr. 1. “Cat and Mouse” (3/20/10) – Anakin is given command of a new stealth ship in order to ferry supplies to their troops behind a Separatist blockade. 32. “Bounty Hunters” (3/27/10) – Anakin, Ahsoka and Obi-Wan crash on a planet and end up involved in a conflict to protect farmers from pirates led by Hondo. 33. “The Zillo Beast” (4/3/10) – When a bomb awakens a giant beast, Mace Windu and Anakin must decide to preserve its species or kill it to secure a treaty with the Dugs for supplies. 34. “The Zillo Beast Strikes Back” (4/10/10) – The Zillo Beast is brought to Coruscant to study its armor and it breaks loose. 46. “Death Trap” (4/17/10) – Boba Fett infiltrates a group of young clones in order to assassinate Mace Windu in revenge for his father. 47. “R2 Come Home” (4/24/10) – Anakin and Mace Windu are trapped in a crashed ship and only R2-D2 can get a message out to save them provided he can avoid threats on the planet. 48. “Lethal Trackdown” (4/30/10) – While Anakin and Mace Windu recover from their injudries, Plo Koon and Ahsoka track Boba Fett to the desert planet of Florrum. 7. “Clone Cadets” (9/17/10) – 5 clone cadets are in danger of washing out unless their team can pull together and finish their training. 52. “ARC Troopers” (9/17/10) – Anakin, Obi-Wan, Shaak Ti and the 501st defend the Republic cloning facilities on Kamino from Grievous and Ventress’ forces. 8. “Supply Lines” (9/24/10) – With Ryloth under siege, the Jedi council sends Bail Organa and Jar Jar Binks to Toydaria to request aid from their king. 53. “Sphere of Influence” (10/1/10) – Ahsoka and Senator Riyo Chuchi must help Chairman Papanoida rescue his family before the Trade Federation can influence his planet’s future. 49. “Corruption” (10/8/10) – While negotiating with the planet Mandalore, Padmé and Duchess Satine discover smugglers have been diluting the citizen’s tea with a hazardous chemical. 50. “The Academy” (10/15/10) – Ahsoka’s class at the Mandalore academy takes a backseat to a nefarious plot discovered by her students. 51. “Assassin” (10/22/10) – While guarding Padmé, Ahsoka is plagued by recurring visions of Aurra Sing assassinating her. 54. “Evil Plans” (11/5/10) – Cad Bane kidnaps C-3PO and R2-D2 in a plot to free Ziro the Hutt. 56. “Hunt for Ziro” (11/12/10) – Obi-Wan and Quinlan Vos search for Ziro while Cad Bane hunts him for the Hutt Council. 57. “Heroes on Both Sides” (11/19/10) – The Republic and Separatists agree to a peace conference, but Dooku has Grievous launch an assault on Coruscant in the meantime. 58. “Pursuit of Peace” (12/3/10) – Pade, Bail Organa and Onaconda Farr try to push a bill through the Senate to buy new clones, but someone works at persuading them out of the idea. 60. “Nightsisters” (1/7/11) – Fearing Asajj’s growing powers, Darth Sidious orders Dooku to eliminate her, driving Asajj back to the mystical Nightsisters to aid in her revenge. 61. “Monster” (1/14/11) – When Dooku requests a new apprentice from Mother Talzin, she has Asajj select a warrior from the Nightbrother village made loyal to Asajj through dark magic. 62. “Witches of the Mist” (1/21/11) – Dooku has his apprentice try to capture King Katuuko pitting him against Anakin and Obi-Wan, and upon his return Asajj enacts her plan against Dooku. 63. “Overlords” (1/28/11) – Anakin, Obi-Wan and Ahsoka are drawn to a distant planet where a family of Force-wielders help to determine if Anakin is truly the chosen one. 64. 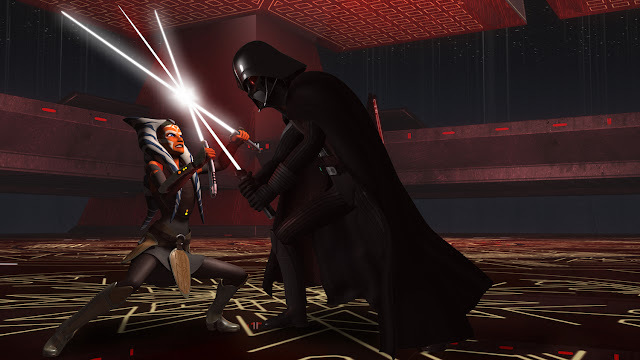 “Altar of Mortis” (2/4/11) – The Son takes Ahsoka captive under the spell of the dark side and attempts to retrieve the only weapon that could kill his father and steal his power. 65. 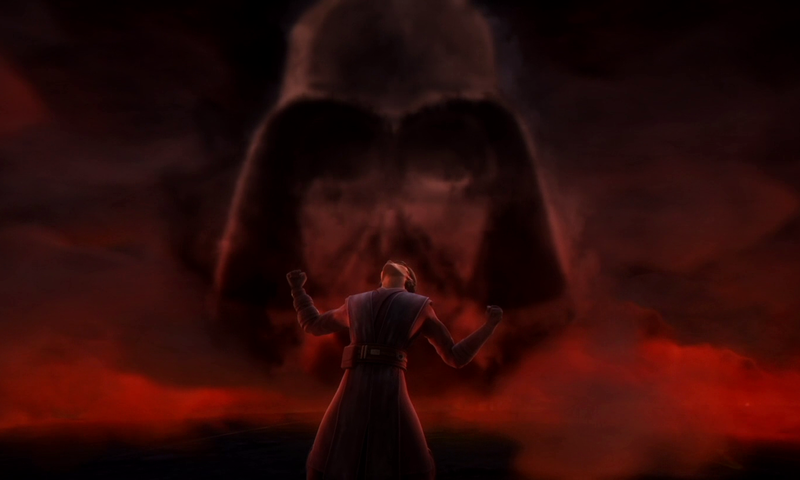 “Ghosts of Mortis” (2/11/11) – The Son attempts to sway Anakin to his side in the conflict by showing him visions of his dark future. 66. “The Citadel” (2/18/11) – Obi-Wan and Anakin lead a squad of Jedi and Clone Troopers on a raid to free Jedi general Even Piell from an impenetrable prison. 67. 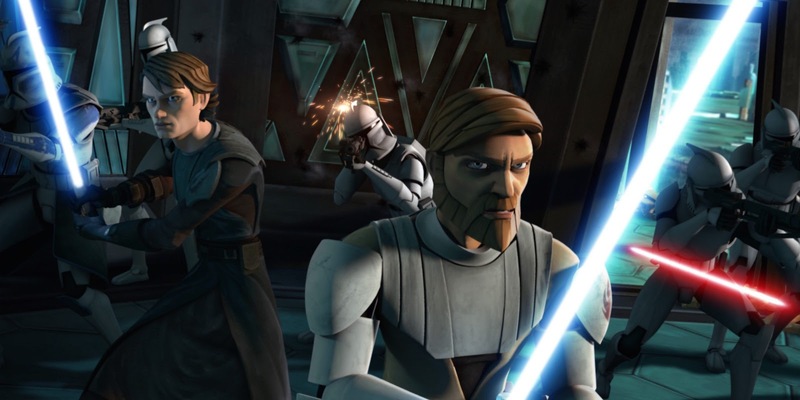 “Counterattack” (3/4/11) – Obi-Wan and Anakin lead their allies to try and escape the perilous Citadel. 68. “Citadel Rescue” (3/11/11) – With their escape craft destroyed, Anakin and Obi-Wan lead the escaped prisoners to safety while they await their rescue from Coruscant. 60. “Padawan Lost” (3/19/11 UK, 3/25/11 CAN, 4/1/11 US) – Ahsoka and a group of kids are trapped on a Trandoshan moon as the prey in a cruel hunt. 70. “Wookie Hunt” (3/26/11 UK, 4/1/11 US) – Ahsoka and the kids find salvation when a new captive is deposited on the moon: Chewbacca. 71. “Water War” (9/16/11) – Anakin and Padmé are sent to stop a civil war on Quarren after a king is assassinated not knowing one of the sides already belong to the Separatists. 72. “Gungan Attack” (9/16/11) – Anakin and his team are overrun by the Separatists while Ahsoka and the prince try to evade capture. 73. “Prisoners” (9/23/11) – The Republic and Gungan forces are captured by Riff Tamson, leaving Ahsoka and the prince to rescue them and heal the fractured populace. 74. “Shadow Warrior” (9/30/11) – Jar Jar must pose as the leader of the Gungans in order to prevent an uprising against the Naboo and stop a Separatist invasion. 75. “Mercy Mission” (10/7/11) – R2-D2 and C-3PO are part of a relief effort when groundquakes devastate planet Aleen, and are the only ones who can save the planet. 76. “Nomad Droids” (10/14/11) – Escaping a Separatist puts R2-D2 and C-3PO in a pirate warship where they are forced to fight in an arena. 77. “Darkness on Umbara” (10/21/11) – Anakin is forced to turn control over his Clone Troopers to Jedi Pong Krell, and Krell assigns them the deadly mission of capturing the capital of Umbara. 78. “The General” (10/28/11) – The Clones have to figure out how to protect themselves while on a suicide mission for Krell. 79. “Plan of Dissent” (11/11/11) – Several Clone Troopers disobey orders and go rogue, finding a better way to carry out Krell’s orders. 80. “Carnage of Krell” (11/18/11) – To save his men from execution, Rex must confront Krell at the risk of charges of mutiny. 81. “Kidnapped” (11/25/11) – Zygerrian slavers abduct an entire colony of people from planet Kiros and plant bombs to cover their tracks. 82. “Slaves of the Republic” (12/2/11) – Anakin, Obi-Wan and Ahsoka go undercover to infiltrate the slavers, and Anakin finds himself struggling with his emotions thanks to a Zygerrian queen. 83. “Escape from Kadavo” (1/6/12) – As Obi-Wan toils in the slave caves, Anakin tries to convince the queen that she is a slave and pawn in a Separatist plot. 84. “A Friend in Need” (1/13/12) – The son of a late Separatist Senator interrupts a peace conference between the sides in order to find justice for his mother. 85. “Deception” (1/20/12) – A deep undercover operation is underway when a Separatist plot to kidnap Palpatine is discovered. 86. “Friends and Enemies” (1/27/12) – Anakin and Ahsoka pursue a group of bounty hunters, not knowing Obi-Wan is amongst them. 87. “The Box” (2/3/12) – On Serenno, bounty hunters from all over enlist in a competition to see who will participate in the plot to kidnap Palpatine. 88. “Crisis on Naboo” (2/10/12) – As Palpatine travels to Naboo, the bounty hunters launch their kidnapping plot. 89. “Massacre” (2/24/12) – Dooku wants revenge against the Nightsisters and Grievous launches an all-out attack against them. 90. “Bounty” (3/2/12) – Lost, Asajj joins a team of bounty hunters led by a young Boba Fett. 91. “Brothers” (3/9/12) – Savage Opress searches for Darth Maul, believing him to still be alive. 92. “Revenge” (3/14/12 FR, 3/16/12 US) – With Maul found, the brothers set out for revenge against Obi-Wan. 105. “Revival” (8/24/12 Celebration IV, 9/28/12 CAN, 9/29/12 US) – Opress and Maul cause terror across the galaxy, forcibly recruiting Hondo Ohnaka and his pirates to their cause. 93. “A War on Two Fronts” (9/21/12 Lucasfilm, 10/5/12 CAN, 10/6/12 US) – Anakin, Obi-Wan, Ahsoka and Rex travel to a Separatist world in order to train a group of rebels to take it back. 94. “Front Runners” (10/12/12 CAN, 10/13/12 US) – Ahsoka leads the rebels in an attack on the capital. 95. “The Soft War” (10/19/12 CAN, 10/20/12 US) – The rebels attempt to rescue their true king and receive unexpected and welcomed aid. 96. “Tipping Points” (10/27/12 US, 11/2/12 CAN) – A full-scale revolt hits Onderon as the rebels make a major blow against the Separatist-aligned king. 97. “The Gathering” (11/2/12 CAN, 11/3/12 US) – Ahsoka takes a group of younglings to Ilum where Yoda will instruct them in the crafting of their lightsabers. 98. “A Test of Strength” (11/9/12 CAN, 11/10/12 US) – On their way back from Ilum, Ahsoka’s ship comes under attack by Hondo and his pirates. 99. “Bound for Rescue” (11/16/12 CAN, 11/17/12 US) – The younglings are forced to use their wits to rescue Ahsoka from Hondo’s pirates. 100. “A Necessary Bond” (11/23/12 CAN, 11/24/12 US) – Ahsoka and the younglings find themselves fighting with the pirates against Grievous’ attack on their base. 101. “Secret Weapons” (11/30/12 CAN, 12/1/12 US) – Colonel Gascon leads a team of droids, including R2-D2, to retrieve an encryption module from a dreadnought. 102. “A Sunny Day in the Void” (12/7/12 CAN, 12/8/12 US) – A comet hits the droids’ shuttle, stranding them on a desolate planet. 103. “Missing in Action” (1/4/13 CAN, 1/5/13 US) – The droids come across a lost clone commando suffering from amnesia. 104. “Point of No Return” (1/11/13 CAN, 1/12/13 US) – The droids have to save a Republic conference from a sabotaged Jedi cruiser. 106. “Eminence” (1/18/13 CAN, 1/19/13 US) – Opress and Maul ally themselves with the Death Watch to further their revenge against Obi-Wan. 107. “Shades of Reason” (1/25/13 CAN, 1/26/13 US) – With the criminal underworld behind them, the brothers and Death Watch launch an attack on MandaloTo re. 108. “The Lawless” (2/1/13 CAN, 2/2/13 US) – Darth Maul uses Duchess Satine to set a trap for Obi-Wan. 109. “Sabotage” (2/8/13 CAN, 2/9/13 US) – Anakin and Ahsoka investigate a bombing at the Jedi Temple and fear a Jedi might have been involved. 110. “The Jedi Who Knew Too Much” (2/15/13 CAN, 2/16/13 US) – The bombing suspect asks to speak to Ahsoka, but Ahsoka soon finds herself framed for her and her guards’ deaths. 111. “To Catch a Jedi” (2/22/13 CAN, 2/23/13 US) – Ahsoka finds herself allying with Asajj in an attempt to investigate the bombing and clear her name. 112. “The Wrong Jedi” (3/1/13 CAN, 3/2/13 US) – Anakin finds the culprit and clears her name, but a disillusioned Ahsoka no longer wants to be part of the Jedi Order. 113. “The Unknown” (2/15/14 GER, 3/7/14 US) – Clone Trooper Tup’s neurological disorder leads to the death of a Jedi Master, and as Anakin tries to investigate they end up attacked by Separatists. 114. “Conspiracy” (2/15/14 GER, 3/7/14 US) – ARC Trooper Fives enters Tup’s mind to discover what led him to kill the Jedi master. 115. “Fugitive” (2/15/14 GER, 3/7/14 US) – While Tup is sent to Coruscant for a physical examination, ARC Trooper Fives discovers a code hidden in the mind of all clones. 116. “Orders” (2/15/14 GER, 3/7/14 US) – Fives attempts to speak with Palpatine about the assassination, but ends up assassinated himself by a clone squad. 117. “An Old Friend” (2/22/14 GER, 3/7/14 US) – On a mercy mission to planet Scipio, Padmé reunites with her old flame who has become the target of bounty hunter Embo. 118. “The Rise of Clovis” (2/22/14 GER, 3/7/14 US) – Clovis strikes a sinister deal to become the leader of his clan, and Anakin’s mistrust of him causes a rift with Padmé. 119. “Crisis at the Heart” (2/22/14 GER, 3/7/14 US) – Clovis’ deal with the Separatists causes war to break out on Scipio, leading the Republic to intervene. 120. “The Disappeared, Part I” (3/1/14 GER, 3/7/14 US) – When Bardotta finds itself threatened by an ancient prophecy Jar Jar has to convince Mace Windu to take it seriously. 121. “The Disappeared, Part II” (3/1/14 GER, 3/7//14 US) – Mace and Jar Jar have to rescue Bardotta’s queen from a mysterious cult. 122. “The Lost One” (3/1/14 GER, 3/7//14 US) – Finding a slain Jedi master’s lightsaber leads Anakin, Obi-Wan and Yoda to reopen the investigation. 123. “Voices” (3/1/14 GER, 3/7//14 US) – Yoda is unsettled when Qui-Gon Jinn contacts him from beyond the grave, causing the Jedi Council to become concerned about him. 124. “Destiny” (3/7/14 GER, 3/7//14 US) – Yoda travels to the birthplace of the Force where he must face countless trials in order to be deemed worthy to learning the deepest mysteries of the Force. 125. “Sacrifice” (3/7/14 GER, 3/7//14 US) – Yoda receives visions of the future during his trials as Sidious and Dooku plot to break Yoda. 126-129. “Crystal Crisis on Utapu” story reels. 130-133. “Bad Batch” story reels. 134-137 & 142-145. Dark Disciple novel. 138-141. Darth Maul: Son of Dathomir comic.